Other searches that seem to work include smart phones. 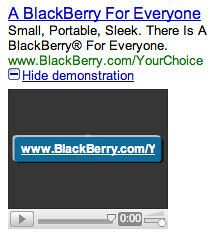 Here is the ad, again for BlackBerry, but this time it says "watch/hide commercial." 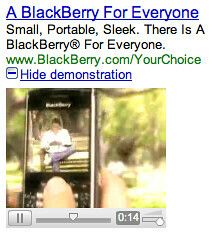 So, clearly, BlackBerry is testing out the AdWords video ads. Wonder if we can spot any other advertisers? 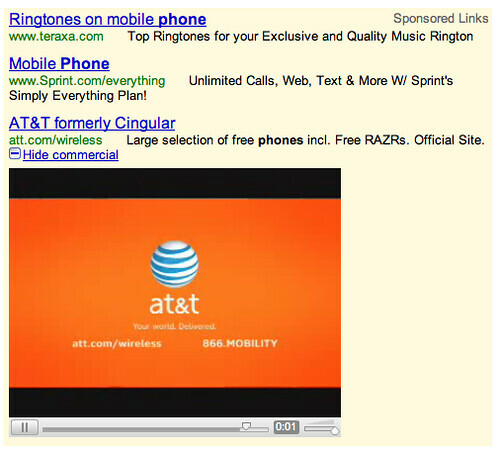 FYI, what triggered me looking was the Yahoo video ads post from this morning. Here is an video of the video ad, so you can see it live. This one is from a search on laptop, which was spotted by Google Operating System.